I randomly decided the other day I wanted to try my hand at infusing my own olive oil. I wish I had some spectacular story as to why I had this thought, but I was making the grocery list, we needed olive oil, I wrote it down, and BOOM I decided to make my own flavored olive oil. The End. Okay, maybe not the END, but it is the end of the story. 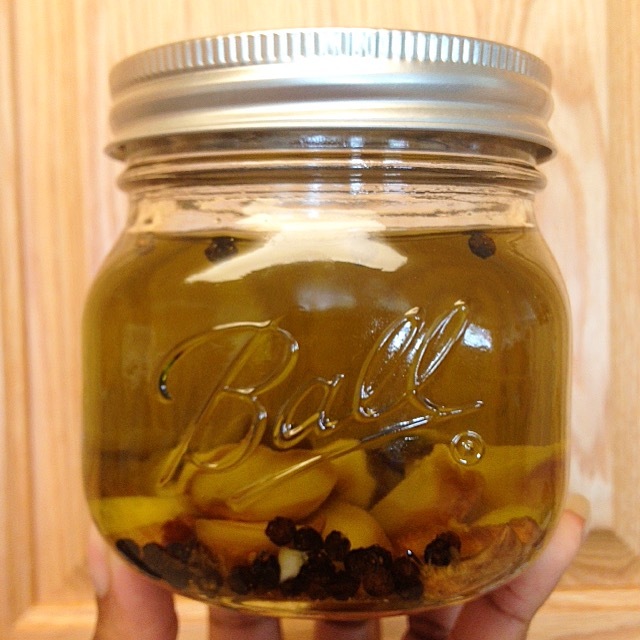 What made me decide to use roasted garlic and whole peppercorn as my infusing ingredients is also pretty simple. When I go to a restaurant that offers bread, balsamic and olive oil as an appetizer, I always add pepper to my olive oil. The roasted garlic spread on top of the mixture is what makes it amazing too. So I figured, why not try using these same ingredients for infusing my olive oil? I combined the ingredients to infuse the olive oil on, Friday August 7th. I even shared the process on a Periscope broadcast which was pretty fun. I strained and funneled the olive oil out of the mason jar, into olive oil bottles, on Wednesday August 19th. I’ve used the peppercorn roasted garlic olive oil for dipping french bread and sautéing vegetables for dinner. It has been amazing so far. I will post the ingredients and instructions below for those of you who would like to give it a try, or something similar. Squeeze your bulbs of roasted garlic into the mason jar. (You can find instructions on how to roast garlic on Google.) Add your two teaspoons of whole peppercorn to the jar as well. Now, add your olive oil until it is full. Put the lid tightly on the jar and store in a cool dark place for 1-2 weeks. Once you are ready to bottle the finished product, using a mesh strainer and liquid measuring cup, strain the oil in the jar to separate the oil, roasted garlic and whole peppercorn. 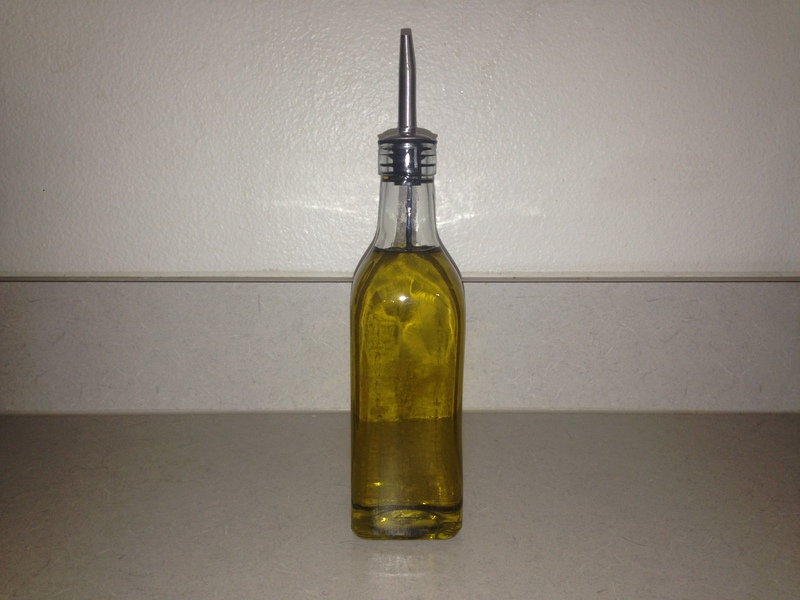 Take the now separated oil and pour it into your measuring cup to pour the oil into the empty olive oil bottle.